OMAHA, Neb. 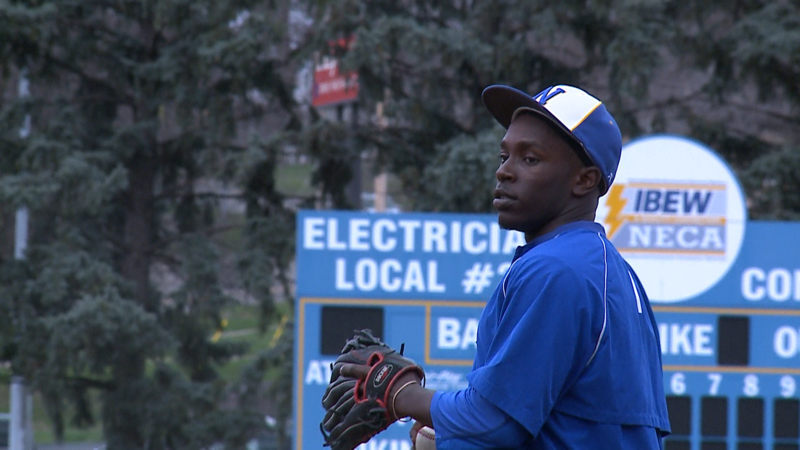 — After a medical scare last August, Devin Safford, a senior at North High School, is putting all of his efforts into his final baseball season. His coaches say his positive attitude and new outlook on life reflects on and off the field. "Don't take anything for granted, because life can be taken from you real quick," Safford, a pitcher and outfielder, said after recovering from cardiac arrest at his job. Safford embraced the lesson on the mound and in his every day life, grateful for each throw he makes. "Some kids don't bounce back from that, what he went through (last) summer," said Steven Faulkner, assistant baseball coach for North High. Just days after starting his senior year, Safford went into cardiac arrest while working at Champions Run Golf Course. "My heart stopped, and thanks to my co-workers that were there with me, they were able to perform CPR until the doctors came," Safford said. "Seeing your child laying there, hooked up to all that stuff, it was, it was devastating," said Tova Safford, Devin's mother. At a young age, doctors found Devin Safford had an irregular heartbeat and diagnosed him with Wolff-Parkinson-White syndrome. He was perfectly healthy until he collapsed in August 2016, leading to surgery where doctors placed an implantable cardioverter-defibrillator in his heart. "Pace him, and then if his heart ever stops again, It'll shock it back into rhythm," Tova said. "One of Devin's biggest concerns was, was he going to be able to play sports again?" Devin Safford didn't walk, but he ran with a new perspective and determination to get back on the mound. "Get back in the weight room, get back on the baseball field and just enjoy life after that," Devin Safford said. That attitude has translated into success for both Devin Safford and his team. "The very first game was emotional for me," Tova Safford said. "I don't think he quite realized how special it was to me to see him out there." Devin Safford not only returned to the field this season but pitched his first ever no-hitter against Benson. "He was hitting his spots," Faulkner said. "He had his teammates around him. He, I mean he was on his game." "I didn't know how to react," Devin Safford said. "I was so excited, and it was great." Faulkner said it's what Devin did after the game that really stood out. "I gave him the ball and he turns back around and gives it my younger son," Faulkner said. "The win was for (Faulkner's son)," Devin Safford said. "It really was. Before one of my bats, he said that (he) was (my) biggest fan and (he likes) watching (me) play. I had to give the ball to him. He was the one who got me through the game and kept me going every inning and he deserved the ball more than I did." With talent on the field and character off of it, Devin Safford keeps smiling and hasn't looked back since that August day. "I mean his smile on his face is so bright and that's, that's a special kid," Faulkner said. "It's made me appreciate every day, because, you know, I wouldn't be here today if it wasn't for my co-workers," Devin Safford said. Devin Safford received an academic scholarship from Creighton University, where he plans to go to college in the fall. He said he's still deciding if he'd like to walk-on and play baseball there, but he has big dreams of becoming a NFL team doctor.